Kurds living in Europe took to the streets across Europe to protest against the aggravated isolation of Kurdish People’s Leader Abdullah Ocalan, and demonstrated their support for the activists on hunger strike in Kurdistan and abroad. As the hunger strike resistance initiated by DTK Co-chair and HDP MP Leyla Güven against the isolation of Abdullah Ocalan continues growing, so do solidarity actions in support of the campaign. Kurds who are living across Europe continue their demonstrations to be a voice for the activists on hunger strike. Kurdish demonstrators and their friends in the city of Cardiff in Wales went to visit Imam Şiş, the Kurdish activist who is on the 52nd day of hunger strike. Hundreds of Kurds and their friends started a march in Cardiff center towards the city council. Demonstrator carried posters of Ocalan, hunger strikers and PKK flags. The demonstrators urged the international community to hear the voice of the Kurdish resistance. When the marchers arrived, a meeting was held in front of the city council in Cardiff. Head of the Plaid Cymru Welsh party and MP Leanne Wood spoke at the meeting. In a speech on behalf of the Union of Democratic Forces in Britain – which includes more than 20 Kurdish and Turkish organizations – it was stated that the hunger strikers were at a critical condition, and the world should listen to them before it is too late. Moreover, a message from Kurdish hunger striker İmam Şiş was read at the meeting. In his words, Şiş greeted the demonstrators, and reiterated that he was confident the hunger strike campaign would prevail. An action was organized in Geneva, Switzerland to support Leyla Guven who is on hunger strike for 91 days in protest of Ocalan’s isolation. The action was organized by activist from the Revolutionary Youth Movement at the central train station where hundreds of informative leaflets were distributed to raise awareness about the Kurdish hunger strikers. 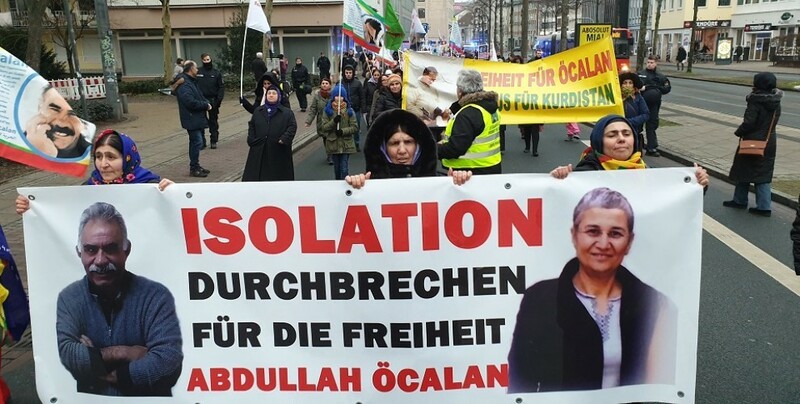 In a demonstration held in the city of Osnabrück in Germany to protest the isolation of Ocalan, several speeches were delivered on behalf leftist groups from Germany. Kurdish demonstrators gathered in front of the central train station Bremen to draw attention to the hunger strike campaign in Kurdistan and abroad. Banners reading “Remove the isolation, free Ocalan” and Guven’s posters were carried during the demo. The protesters urged the German government and European states to hear the voices of the hunger strikers. Local members of the Left Party, the Communist Party of Germany, and the co-chair of the Cemevi (Alevi place of worship) in Bremen were among the participants. Similarly, Kurdish people in Stuttgart took to the squares in order to speak up for the hunger strikers. During the demonstration which was supported by Germany’s leftist groups the latest situation of Kurdish activists on hunger strike was explained. The demonstrators expressed their support with the demands of hunger strikers.